Brown beef in a large soup pot. Drain in a colander in sink. In the same pot, heat the olive oil. Add the onions, carrots, celery, and garlic and cook for 2 minutes. Stir often. Add the drained beef back to the pot. 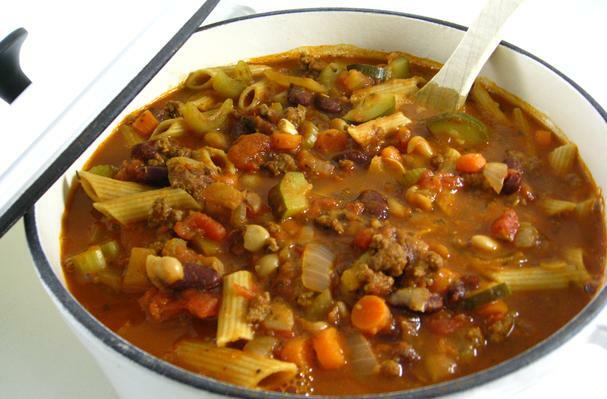 Stir in the canned tomatoes, beans, beef broth, spaghetti sauce, zucchini, water, Italian seasonings and pepper. Bring soup up to a boil. Turn heat to a simmer, cover and let cook for 50 minutes. Add pasta to the soup. Cover and cook for about 10 minutes longer until pasta is ready.